Forty years ago, on December 4, 1969, 21-year-old Fred Hampton, a charismatic leader of the Illinois Black Panther Party, was murdered as he slept in his home on Chicago's West Side. Shortly before dawn, fourteen armed police officers, ostensibly serving a search warrant, shot nearly one hundred rounds of ammunition into his apartment, killing Hampton and twenty-two year old Mark Clark and wounding several other young members of the Black Panther Party. 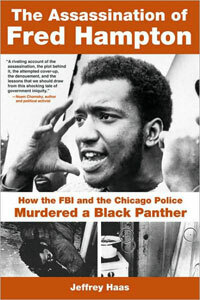 The Assassination of Fred Hampton: How the FBI and the Chicago Police Murdered a Black Panther, by Jeffrey Haas, tells the story of the 13 year legal battle that eventually uncovered a conspiracy between the FBI, the Illinois State's Attorney's office, and the police, to kill Fred Hampton and destroy the Black Panther Party. Jeffrey Haas was one of the lead lawyers representing the Hampton and Clark families and those who survived. In a riveting memoir that reads like a docudrama, Haas introduces the reader to the politics of the late 1960s and to young Fred Hampton, a magnetic public speaker and community organizer. Haas then provides a play by play history of the tensions between the Black Panther Party and the police, and a guide through the labyrinthine twists and turns of the legal struggle waged to avenge Hampton's death. His account is one of egregious abuse of power by state, local and federal law enforcement. Haas takes the reader through a series of attempts to whitewash the illegal conduct of the law enforcement officials who staged and carried out the raid. State's Attorney Edward Hanrahan charged the survivors of the raid with attempted murder of the police. An internal police department investigation exonerated the officers who shot Hampton and Clark; the Cook County Coroner ruled Hampton's death justifiable homicide. Later, a federal grand jury refused to indict the police or State's Attorney Hanrahan, even though it issued a report containing damning evidence that the police shooting was unprovoked by the Panthers. The court dismissed Hanrahan's charges against the survivors in the face of the physical evidence. All but one of the 90 plus bullets came from police weapons and had been shot into the apartment, and Hampton had been shot at close range, with two bullets to the head. Yet, as Haas explains, the dismissals of criminal charges against them brought the surviving Panthers, and the Hampton and Clark families, no closer to justice. Outraged civil rights leaders and community members demanded that those who killed Hampton and Clark should be held accountable. As one elderly woman put it after viewing the blood-soaked mattress where Hampton was slain, "this was nothing but a Northern lynching." Haas and his colleagues at the People's Law Office filed a federal civil rights suit on behalf of the Hampton and Clark families and the raid's survivors. The judge threw their case out of court. While that decision was on appeal, continuing pressure from the community and the press prompted the Chief Criminal Court Judge to appoint a special prosecutor, respected Chicago attorney Barnabas Sears. Haas writes that when Sears sought indictments against the State's Attorney and the police, the judge who had hired him ordered the indictments sealed and cut off his funds. Only after an appellate court intervened were these indictments unsealed. Three years after Hampton and Clark's deaths, the independent prosecutor indicted the police and State's Attorney Hanrahan, albeit for "obstruction of justice" rather than murder. As Haas tells it, throughout this ordeal of justice delayed and denied, he and his law partners took heart from one of Fred Hampton's speeches: "If you dare to struggle, you dare to win. If you dare not struggle, then damn it, you don't deserve to win." And struggle they did. Just when the reader begins to hope that the bad guys will finally get their due, Haas shows us how difficult it was for the truth to emerge in the face of persistent government denials. In the criminal trial against the police and State's Attorney Hanrahan, lawyers for the indicted officials focused almost entirely on the purported violence and anti-police rhetoric of the Black Panther Party, rather than on the evidence against their clients. Ruling that the prosecution had provided "insufficient evidence" of a conspiracy, the judge found all the law enforcement defendants not guilty. The acquittals came just a few days before an election in which State's Attorney Hanrahan was trying to keep his job. The only solace the Panther families and their lawyers could take from this turn of events was that Chicago voters threw Hanrahan out of office. After several more years, another dismissal and another appeal, Haas and his colleagues finally gained access to the evidence that the FBI had buried for so long. The judge granted a hotly contested discovery motion for material about the FBI's covert intelligence program and the FBI eventually turned over more than five hundred boxes of documents in response. Painstaking review of the discovered documents turned up proof that the FBI had planted an informant in the Black Panther Party and had concealed that information from all the previous investigations and trials. The FBI's informant, William O'Neal, was Hampton's trusted friend and bodyguard, and ironically, the person in charge of security for the Panthers on the night of the killings. The connecting link between the FBI and the police who carried out the raid was a blueprint of Fred Hampton's apartment which the FBI had provided to the Chicago police. The blueprint had been drawn by O'Neal for the FBI. The location of Hampton's bed was clearly marked. The conspiracy was proven. The lawyers had uncovered an explicit FBI plot to destroy the Black Panther Party and to bring down its leaders. It was this evidence that ultimately led to a victory, of sorts. In 1983, Haas and his colleagues at the People's Law Office achieved some justice for their clients, a $1.85 million settlement, paid out in equal part by federal, state, and local law enforcement agencies. Haas' story is also an indictment of J. Edgar Hoover's FBI for its covert attempts to, in words taken from COINTELPRO documents, "neutralize" the Black Panther Party and prevent the rise of an "electrifying leader." Fred Hampton, as portrayed by Haas, was just such an electrifying leader. Haas shows us the impact Hampton and the Chicago Panthers had on their community: they initiated free breakfast programs for children, organized against police brutality and worked to create cross-racial coalitions. He quotes a mother's lament, from Iberia Hampton: "People should not forget that State's Attorney Hanrahan, the Chicago police, and the FBI murdered my son . . . .Who knows what he may have become, if they hadn't killed him?" Susan Rutberg is a Professor at Golden Gate University School of Law in San Francisco. In 1975 she volunteered with the People's Law Office to work on the Hampton civil rights suit.